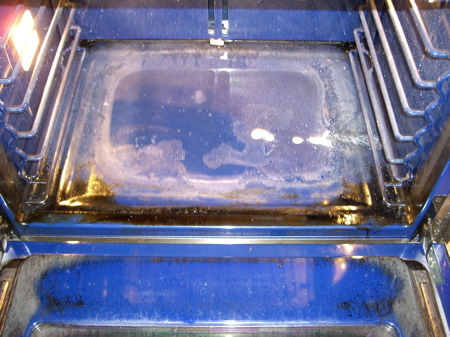 Though Consumer Reports had remarked about the Wolf dual-fuel ovens’ lackluster self-cleaning (model number DF304 – 30″). I took that as requiring just a little more effort on my part. I should have listened. The images tell the story. 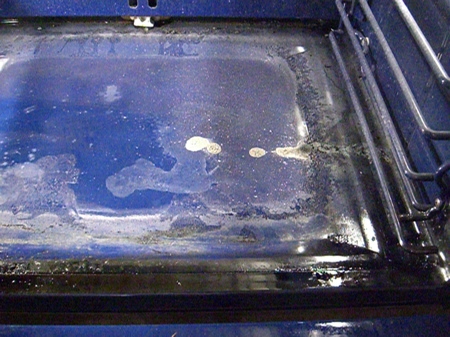 There is just lots of stuff that will not come out if run throught the self-cleaning cycle. On page 42 of my manual it states: “Never use oven cleaners. They are not necessary with the SELF-CLEAN mode.” What am I supposed to do, live with huge black stains?